After our bike tour, we headed over to the Milestone Hotel, which was rated as having one of the best afternoon teas in all of London – of course we had to give it a try. The Milestone is located a short walk from the High Street Kensington Tube Station and on the South East corner of Hyde Park. We were seated on a couch and given a menu straight away. Almost immediately after the menu was delivered we were introduced to our server who brought warm towels so we could clean up before the main event. 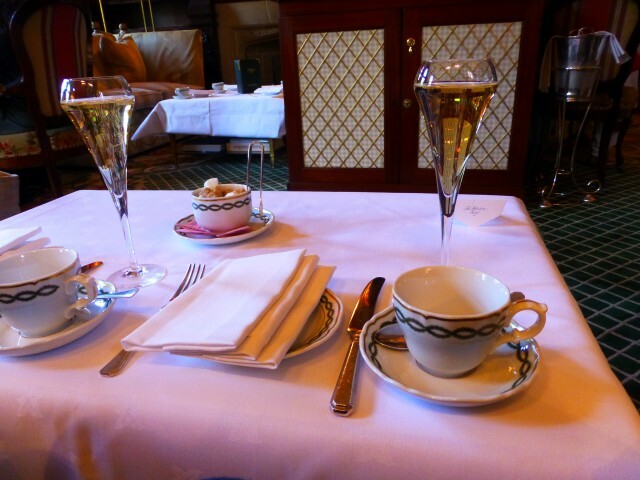 We opted for the champagne tea – well, because everything is better with champagne, isn’t it? The table was set and a demi-bottle of champagne arrived. Our server looked like he had been working at the Milestone since Churchill was in power. He was good, quick and pretty friendly. He did what he needed to do, but since we were the last seating for tea he was a bit hard to track down – I think he was helping set up for the dinner service. 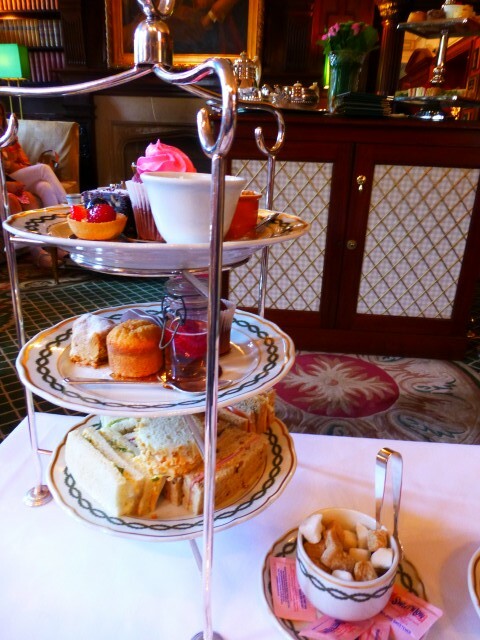 I’m not a big fan of tea in general, but I do love the whole afternoon tea experience. I drink my tea with lots of milk and at least one (often more) sugar. The finger sandwiches were very good. Our sampling consisted of the standard cucumber and cream cheese, a Scottish Salmon, a cheddar and tomato, an egg salad, a chicken salad and a ham option. My favorites were the tomato and the ham. Tomatoes are by far my favorite food on the planet and who doesn’t like a bit of ham. There were also scones served with the tea which were accompanied by some clotted cream and a bit of lemon curd. Love me some lemon curd. Since they were in season, we were also given a nice bowl of sliced strawberries — although they were far from ripe, but still a nice addition. For dessert we had a mini red velvet cupcake (which was quite dry), a fruit tart, an eclair, a crème brûlée and a couple of macaroons. My favorite was the latter, of course. We sat at the Milestone for about 2 hours enjoying the tea and the quaintness of the whole process. The room was about half full and most people kept pretty much to themselves but a couple of times folks were asking what we were thinking of the service and the food. 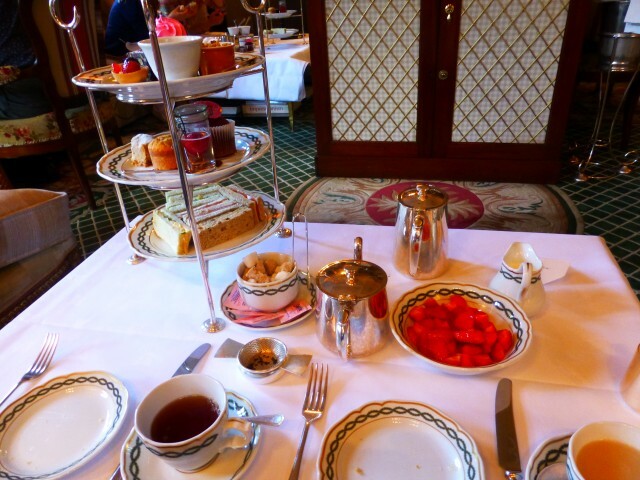 Do you dig afternoon tea? Where do you go when you want a great tea in London — and I don’t just mean the beverage, I mean the full service option?